Celebrate the club's 70th Anniversary! The British Chihuahua Club was founded on 22nd May 1949. This year sees our 70th — Platinum — Anniversary, and to celebrate there will be an extra special Anniversary Championship Show in November (more about that later in the year.) Meanwhile it's also the 30th edition of our yearbook, the Chihuahua Chronicle, so this year's is a special edition to mark both events. With a special cover, more colour, and more beautiful adverts, the book continues to be just £8 a copy at our shows or £10.50 including p&p by mail order via this website (£14.00 posted to Europe or £16.00 to other destinations.) - click here to go to our shop page. To be held shortly before the 70th Annversary of the founding of the club, we are saving the big celebrations for our Championship Show in November, but please support us at our Open Show on Sunday May the 5th at Brackley Leisure Centre, Northampton, which is kindly being sponsored by Royal Canin. Lynn Hill is judging Smoothcoats, Emma Huntley the Longcoats, while our BIS judge will be Mrs Edith Lynch. As well as framed certificates for the principal show winners there is of course prize money to be won in every class,from £1.50 for a win to 50p for a third place. Unfortunately the venue's cafe is unable to supply hot meals, but hot bacon sandwiches and prepacked snacks will be available at the show. Entries: You can download a schedule and entry form from Fosse Data, where you can also enter and pay online. Alternatively you can request a printed schedule from the Hon Secretary at the address below and return your entry by post to the Hon Treasurer. The Club's membership year runs from 1st January to 31st December and subscription renewals are now due. It's easy to forget to renew, and this can mean you don't receive the Club's annual newsletter and may no longer be eligible to enter our shows at the favourable Members' rate, and so we encourage members to set up a Standing Order with their bank to pay their subscription automatically each year. You can click here to download a form to print out, complete and send to your bank or you can request a printed form be sent to you by the Hon Treasurer. It helps the club greatly to receive subscriptions promptly in this way, and we thank all those who already do so. Our 2018 Championship Show was held at Brackley Leisure Centre in Northamptonshire on Sunday 18th November. Our BIS judge was Mr Richard Kelsey and there was keen competition for top spot. This year is the 70th (Platinum) anniversary of the founding of the British Chihuahua Club. It also sees the 30th edition of the club's Yearbook, first published as the Chihuahua Chronicle in 1990 for the year 1989. This is therefore a special commemorative edition. It went on sale at Crufts (10th March) and will shortly be available through this website and at our club events. Meanwhile the 2018 British Chihuahua Club Yearbook is still available through this website, as well as British Chihuahua Club ceramic mugs and some special fine bone china mugs commemorating 30 years of Chihuahua Rescue. Click here for more details. The rule changes that were agreed at our AGM have now been approved by the Kennel Club, along with two changes of wording they put forward. The current version of the Club's rules can be viewed here on the website. Printed rulebooks may also be found on sale at £1 at Crufts and at our club events, or by post from the Treasurer at £1.60 including postage. Our 2018 AGM took place on Sunday 25th March. Mr Graham Foote, who took over the role of Chairman during 2004, stepped down at the AGM and Mrs Shelda Hornby was appointed as Chairman in his place, while Mr Foote became Vice Chairman. 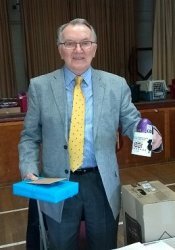 As seen in the picture, Mr Foote was presented with a rare orchid and a special Club ceramic mug. Our previous Hon Secretary Mr Adrian Bickers also resigned from the Committee, and Mr James Culverhouse has agreed to become Secretary. Bernard Coxhead remains as Treasurer and we welcome two new members who were co-opted onto the committee, Mrs Vicky Osborne and Miss Hazel Senior. The other important matter dealt with at the AGM was an amendment to our rulebook. Members present voted to accept the proposed changes, which have since been approved by The Kennel Club. The club's financial year will in future run from 1st April to 31st March, and the AGM will take place within 3 months of the new year-end. It's intended to hold future AGMs at our Open Shows, which are held in May, hopefully encouraging many more members to take part.